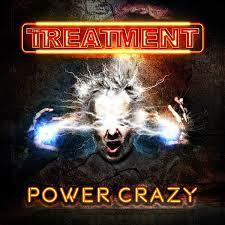 Share the post "Album review: THE TREATMENT – Power Crazy"
The Treatment have been the bridesmaid in rock for far too long. They have been the perennial support band with some major tours under their belts but they have never managed to make the breakthrough into the major headliner league. This is album number four from the band and the first with new vocalist Tom Rampton. The guys have produced a polished rock album which lands somewhere between AC/DC and Buckcherry which is no bad thing. Blues laden with a down and dirty sound this is a good album to enjoy with a beer or two and the songs will sound fantastic live. Opener ‘Let’s Get Dirty’ gets things off to a good start with a driving riff and a great chorus. Rampton’s vocal does sound very like Josh Todd from Buckcherry and you could be forgiven for thinking that the opener is a new BC track. ‘Rising Power’ is another fast paced rocker, you can imagine the beer flying and heads banging along to this one in a live setting. The first track to be released from the album ‘Bite Back’ is another faster track with a singalong chorus which has been the mainstay of the band since their first album ‘This Might Hurt’. It’s not all high speed, high tempo stuff though, there are some excellent slower numbers here too like the slow blues of ‘Luck Of The Draw’ and ‘Waiting For The Call’ which highlight the guitar talents of Tagore Grey and Tao Grey. ‘Laying It Down’ and ‘Falling Down’ demonstrate all that’s right with this band, great songwriting, strong melodies and good honest rock, what’s not to like? This is a great album from a band who have had their share of good breaks but ultimately have failed to fully capitalise on them. However, that is no slight on the talent or musicianship of the guys, it just proves how fickle the music business can be. This entry was posted in ALBUM REVIEWS, ALBUM REVIEWS (Mobile), All Posts and tagged AC/DC, album CD, Buckcherry, Def Leppard, Frontier Records, Kiss, metal, Power Crazy, rock, Tagore Grey, The Treatment, Tom Rampton. Bookmark the permalink.